Obama has not done so. The administration has failed or refused to submit the IAEA side deal with Iran regarding the possible military dimensions of Iran’s research at the Parchin military facility to Congress. Indeed, the administration claim not even to have seen the IAEA side deal. Rather, administration officials claim only to have been briefed by the IAEA on the terms of the side deal. They claim it is cloaked in secrecy that prevents its disclosure. The side deal is nevertheless an integral part of the JCPOA and its disclosure expressly required by the act. Obama’s noncompliance with the act is more than problematic. It precludes (or should) the president’s authority to waive sanctions. It prevents (or should) the JCPOA itself from coming to a vote in Congress. Yet little notice has been taken of any of the serious issues that Obama has created in the service of his Iranian fantasies. As always, Obama acts by the executive equivalent of main force and trusts others to fall into line. At the least, the congressional leaders should refuse to call up the JCPOA for a vote of approval and “register their view” as Pompeo and Rivkin suggest. Congress should force the issue in other ways within the scope of their powers. I don’t know about the proposed judicial remedy; it seems like weak tea. I don’t have the answer, but Congress should not proceed as though the conditions precedent to a vote of approval and the waiver of sanctions have occurred as required under the Corker-Cardin bill; they have not. via US: System reached to let UN inspect Iran military sites | The Times of Israel. An agreement has been reached in talks between Iran and major powers towards a nuclear deal that will give the UN atomic watchdog access to all suspect sites, a senior US official said Monday. “The entry point isn’t that we must be able to get into every military site — because the United States of America wouldn’t allow anybody to get into every military site — so that’s not appropriate,” the official said. “But if, in the context of agreement… the IAEA believes it needs access, and has a reason for that, access then we have a process [whereby] that access is given,” the official said on condition of anonymity. If the system is agreed to by Iran, it could mark a potential breakthrough in months of negotiations with the Islamic Republic, which has refused to give the International Atomic Energy Agency access to sensitive sites. “There are conventional purposes, and there are secrets that any country has that they are not willing to share,” the official added. The access to military sites has been one of the key sticking points in negotiations, with Western powers urging Tehran to open facilities to international inspectors, and Supreme Leader Ayatollah Khamenei — who has the last word on the nuclear negotiations — adamantly refusing. The anonymous US official stated that Washington had long insisted that if the IAEA felt it needed access to a site that was suspect, “then they should be able to get it. “If that happens to be a military site, then that should be available,” the representative went on, adding that the IAEA had an “institutional responsibility” to explore what the possible military dimensions of Iran’s nuclear program may have been. US Secretary of State John Kerry warned earlier on Monday — as he awaited the return of Iranian Foreign Minister Mohammad Javad Zarif from consultations in Tehran — that it was too soon to tell if a nuclear deal with Iran is possible. 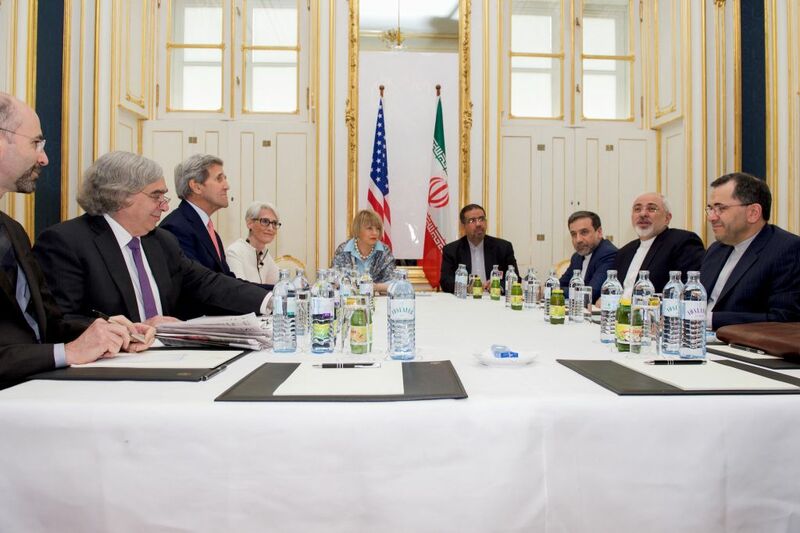 “We’re just working and it’s too early to make any judgments,” Kerry told reporters in Vienna following a weekend of intense talks with counterparts from five other major powers and Iran. In a possible sign, meanwhile, of progress, Russian Foreign Minister Sergey Lavrov said that he would arrive on Tuesday, coinciding with the expected return of his Iranian counterpart. French Foreign Minister Laurent Fabius, speaking in New York, said he would be back in Vienna this week. It was unclear when his British, German or Chinese counterparts might follow suit. Over the weekend, officials from both sides made clear that their Tuesday deadline to nail down a deal was highly unlikely to be met, although they said they would only extend it by several days. Zarif flew back to Tehran on Sunday night, as did many of the other ministers. In April, Iran and the P5+1 group — the United States, China, Russia, Britain, France and Germany — agreed on the main outlines of a deal that they hope will end a 13-year standoff over Iran’s nuclear ambitions. Under the framework, Iran will dramatically scale down its atomic activities in order to make any drive to make a weapon — an ambition it denies having — all but impossible. This includes slashing the number of centrifuges enriching uranium, which can be used for nuclear fuel but also in a bomb; reducing its uranium stockpile; and altering the Arak reactor. In return, the powers have said they will progressively ease sanctions that have suffocated Iran’s economy, but while retaining the option to reimpose them if Iran violates the agreement.